Last week, I showed an image of a group of hikers I joined for a hike up Mt. Cube. This is the view from the mountain. The view was worth the climb. This entry was posted in Uncategorized on March 31, 2018 by milfordstreet. In many cities here in the U.S. and around the globe, there were marches and rallies spurred by the school shooting in Florida a month ago. These images show the march in Boston. It was a large crowd. We’ve already heard an estimate of 100,000 people. I’m not sure what the solution to this problem is. I doubt it will be found by relegating the responsibility to one factor or group. But we do need to move beyond thoughts and prayers in the aftermath of mass shootings and come together on solutions. This entry was posted in Uncategorized on March 24, 2018 by milfordstreet. 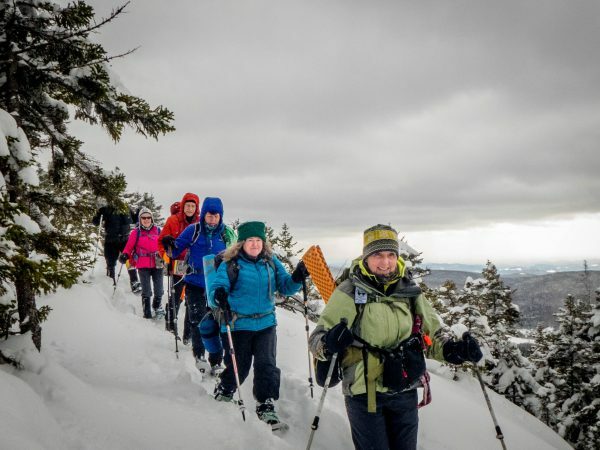 I joined this group of hikers from the Appalachian Mountain Club on a snowshoe hike of Mount Cube in the White Mountains. 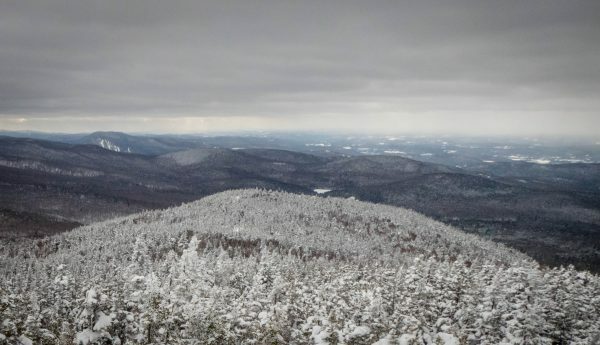 It was not a long hike, but recent snow made the trail very difficult to climb because we were the first hikers on it. Packing down all of that powder was a bit of effort, but we had a good time. It took us about six hours to go four miles round trip. This entry was posted in Uncategorized on March 23, 2018 by milfordstreet. 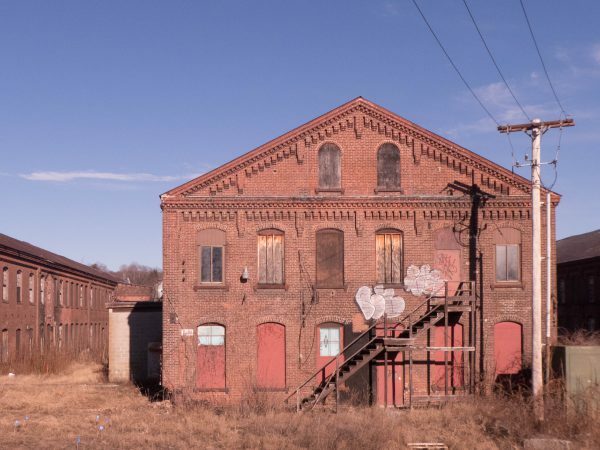 Fitchburg’s paper mills needed power. Originally, this was provided by the water in the Nashua River. Later a central steam plant was constructed. It provided steam to a number of mills. A pipeline carried the steam from the plant to the individual mills. The steam plant was torn down a few years back, but the steamline remains. There is a trail that you can walk along the steam line. It runs about a kilometer or so. It’s interesting because big loops were inserted into the line in order to help account for expansion. A set of plaques tell the history of the steamline and the paper mills. These are the last of my photos from Fitchburg. I plan to go back and make more. We’ve had some rather snowy weather here in the northeastern US. I am waiting for things to clear up a bit and perhaps a bit of greenery to come out. This entry was posted in Uncategorized on March 18, 2018 by milfordstreet. Big paper mills require a fair amount of maintenance work. The buildings shown here are on a small wedge of land formed by a fork in the road. At least two are in use for other purposes now. You can see that the one with the very yellow door has been restored. This entry was posted in Uncategorized on March 17, 2018 by milfordstreet. A few days after I made the image I showed yesterday, I returned to walk among the buildings and take more photos. Not all of the buildings in this complex are abandoned, but most of the ones here are vacant. This entry was posted in Uncategorized on March 11, 2018 by milfordstreet. During a trip to Fitchburg on a recent warm day, I stopped at Dairy Queen for an ice cream cone. I noticed this building and the light hitting it. This was shot over the fence from the parking lot of the Dairy Queen, but I got the sense that I could easily gain access to the area where the buildings are located to make more images. The results of that exploration will wait unitl tomorrow. This entry was posted in Uncategorized on March 10, 2018 by milfordstreet.